Which blinds of ours may you consider? Our broad range of designs of blinds helps to ensure that you choose the right solution for the room of your home in which you intend to install them. When you’re seeking out the perfect blinds for a living room, for instance, you may give our vertical blinds some serious thought. They’re an especially sound choice for covering large windows, and can be specified in a colour to match your existing decor. If, though, it is bathroom or kitchen blinds that you’re looking for, what about some metal Venetian blinds like those of our Aluwood range, which combine the appearance of a natural wooden blind with the practicality of aluminium blinds? These blinds are a great solution for any room that is often hot, warm or steamy. A similar balance between practicality and style is achieved by our Fauxwood blinds that are as hardwearing as PVC blinds, but look like genuine wood. They make sense as conservatory, bathroom or kitchen blinds, so you might be tempted to use the same blind design in various areas of your Kent house. From dedicated pleated conservatory blinds that are available in more than 110 different fabrics and contemporary and luxurious Roman blinds, right through to stylish roller blinds and wooden Venetian blinds with their unmistakable slats, we really do give you every option here at All Kent Shutters and Blinds. Furthermore, we can give you a free competitive quote for any of them, wherever you live in Kent. 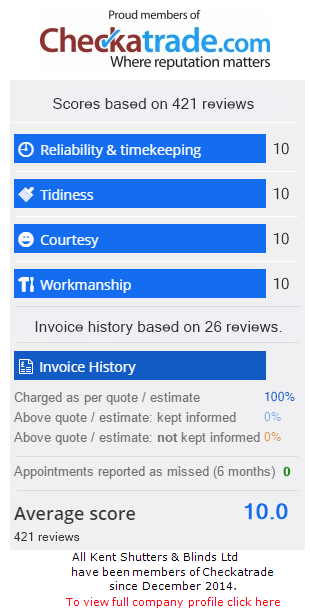 Simply email or phone our professional and friendly team now to find out just how affordable our blinds for homes across Maidstone, Sidcup, Bexley, Bexleyheath and other parts of this beautiful county can be this spring and summer.